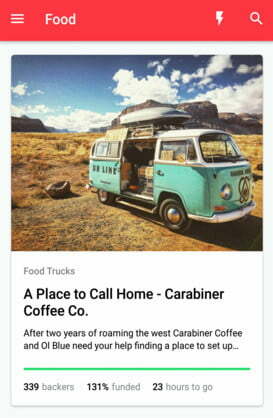 Kickstarter has finally gotten around to rolling out an Android app for its site, three years after its iOS version launched. It’s not clear why it’s taken so long, but Android users heavily into crowdfunding will surely be pleased to have an easier way to explore and interact with the site. Well, perhaps. You see, the app is pretty basic compared to the iPhone version, letting funders – or potential funders – do little more than search the site’s database of weird and wonderful projects, as well as track those they’ve already backed. No, unlike its iOS counterpart, there’s nothing here for creators, so in other words, no opportunity to add content like updates to a project page. The company explains that with this initial version it wanted to create a “great discovery experience for backers [that makes it] easy to dive into thousands of live creative projects from every corner of the Kickstarter universe.” In that respect, it’s hit the mark. If you’re a Kickstarter fan with an Android device, you can grab the free app from the Google Play Store here.